1 2 "Stagecoach Group to make swoop for Bluebird". Manchester Evening News. 7 November 2012. Retrieved 7 November 2012. ↑ Lidstone, John G (April 2009). "Fleet in Focus: Bluebird Bus & Coach". Buses (649): 55. 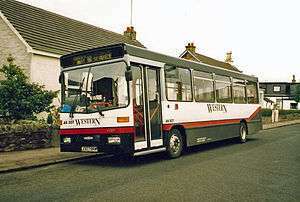 ↑ "Bolton Metroshuttle takes off, Stockport's due by Christmas". Manchester Buses. Retrieved 29 January 2011. ↑ "GMITA - Metroshuttle Patronage and Performance". GMITA. Retrieved 29 January 2011. ↑ "GMPTE - Buses - Latest Changes". GMPTE. Retrieved 14 February 2011. ↑ "Acquisition of bus operations in North Manchester". Stagecoach Group. 7 November 2012. Retrieved 7 November 2012. 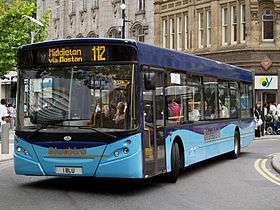 ↑ "Anticipated acquisition by Greater Manchester Buses (South) Limited, a wholly owned subsidiary of Stagecoach plc, of Bluebird Bus & Coach" (PDF). Office of Fair Trading. Archived from the original (PDF) on 18 October 2013. Retrieved 27 February 2013. ↑ "ManchesterBluebird". Stagecoach Bus. Retrieved 27 February 2013.